Hello! My online order of recent new arrivals arrived today – including the Teddie Pant in Mirrored Floral. My local store only received the solid color of these pants so I am glad that I ordered these to try. 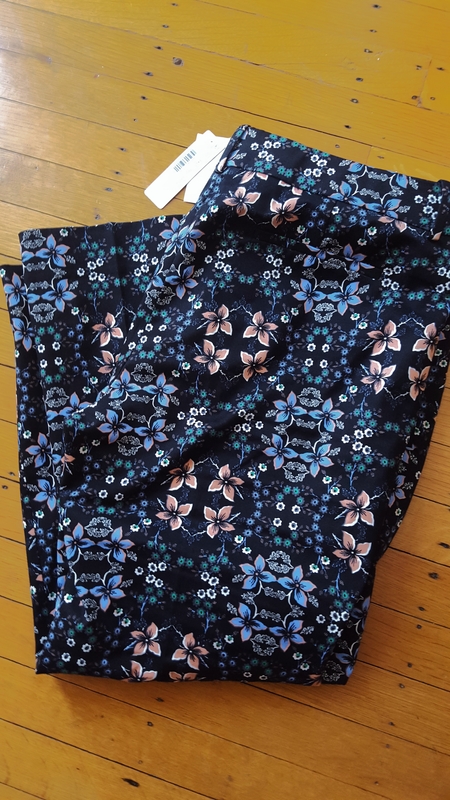 I ordered the pants in a size 12, which as I stated in this post with the February new arrivals, is the same size I take in the Campbell cotton capris and trousers, Minnie pants and Martie pants. For most suiting, I tend to need a 14. In person, the print reads a little duller than the website in my opinion. The pink is more of a salmon pink and my brighter pink shoes were not the right match with them. The blush shade worked better. I like the grey sweater and pink shoe pairing in the photo above and I think the Tippi Sweater in Heather Breeze or the Lightweight Wool Tunic Sweater in Flamingo and Peri would also be good pairings with these. For today’s try on, I went with what I was wearing, which was a black turtleneck, which aside from their cropped length could bring them more in to early spring. I liked these a little better in the shorter length than the solid ones and I still want to try the solid ones in the tall length. These don’t come in the tall length and I found them to be a little less stretchy than the solid ones, as they are cotton and spandex vs. the solid ones being a cotton/viscose/elastane blend with more give to the fabric. I still was ok with the 12 in these. I’m not sure why they made the two styles of pants a different fabric composition but the difference was noticeable to me. I personally like the look of them better with heels but tried flats for a comparison. I think if they were a little longer I could get away with flats in them and if these hit lower on your leg, flats would work. I felt like I was wearing floods and felt a little stumpy in the flats with the flared leg of the pant. Paired with a lighter colored top and shoes these will carry through spring. I would have liked to see more concentrated colors in this print, the faded colors get a little lost in the black background in my opinion. I’m surprised we didn’t see this print in a blouse, but there is an A-line midi skirt, scarf and a very pretty Silk Cap-Sleeve Dress which really isn’t the exact same print even though it’s called the same thing. So, what do you think? Are you a fan of the new Teddie pant? How about the mirrored floral print? Would love to hear what you think and thanks for visiting!